For the lucky few – journalists, celebrities and royalty – the Chelsea Flower Show starts today. The rest of must wait until 8am tomorrow when the show opens to members of the Royal Horticultural Society. With the temperature due to remain in the high twenties, HRH The Queen will need her sunscreen when she gives the show her seal of approval this afternoon. Back in the less rarified environs of Highgate, my outdoor thermometer is already reading 26 degrees and it’s only just time for elevenses. I have abandoned the already delayed task of planting out my sweet peas, so as not to stress them further. The goldfish are basking shamelessly in the warm water at the edge of the pond, between pots of marginal plants. A fat wood pigeon is sunning itself on the paving, taking a refreshing drink and observing me cautiously. Thankfully the sun will soon move around to the other side of the building, leaving us all in the cool shade again. 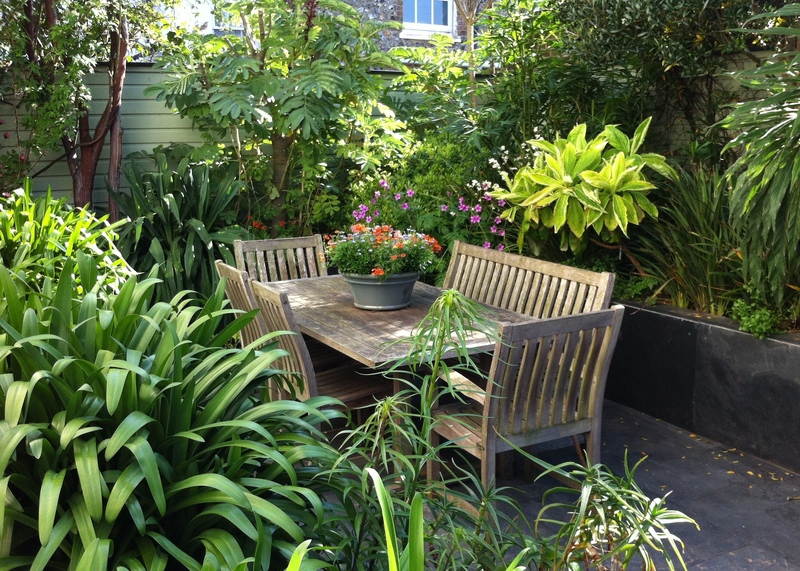 Our London garden, like me, very much designed for cooler conditions. As soon as Chelsea approaches I feel the need to ensure both gardens are ship-shape and Bristol fashion (which, my overseas readers, is an English way of saying ‘sorted out’). Whilst neither could hold a candle to any of Chelsea’s show gardens, it’s a task which means I can feel slightly less inadequate when I walk Main Avenue tomorrow. Late May is the junction at which spring gives way to summer. Pots of tulips and daffodils have come to an emergency stop and perennials have their feet firmly on the accelerator, trying to escape the infamous Chelsea chop. 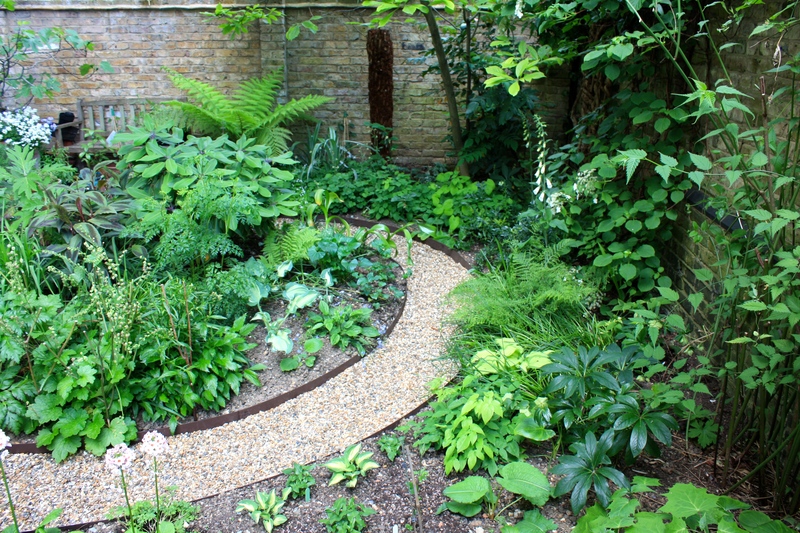 In London green still dominates, with tiny pops of white in the form of Hydrangea anomala subsp. petiolaris (climbing hydrangea), Galium odoratum (sweet woodruff), Digitalis purpurea ‘Alba’ (white foxglove) and Polemonium caeruleum var. lacteum (white Jacob’s ladder). Chelsea plant of the year in 2011, Anemone ‘White Swan’, is tantalisingly close to producing the first of its pure white flowers, each petal sporting a violet-blue band on its reverse. 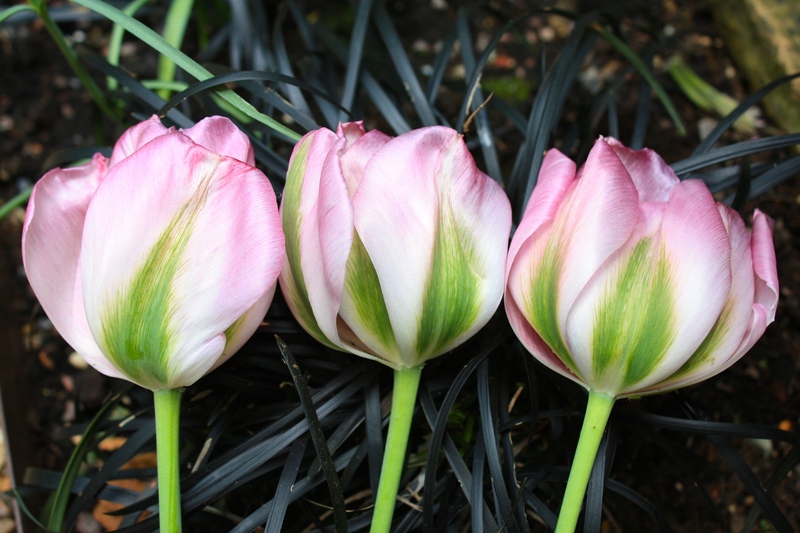 Incredibly, Tulipa ‘Greenland’ is still fighting on, having graced the garden with its green-tinged pink flowers for weeks. Alongside Primula japonica ‘Apple Blossom’, they were as pretty as a picture for the brief time their flowering season overlapped. 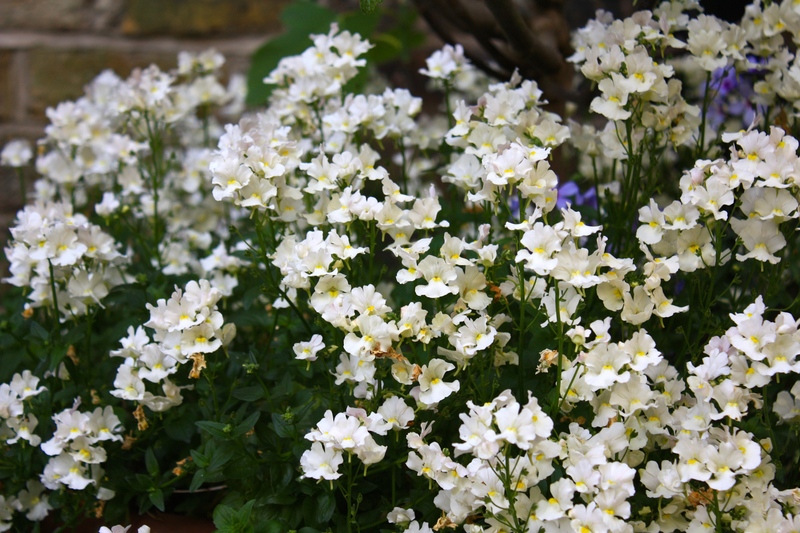 A plant which I have been meaning to applaud for months is Nemesia ‘Lady Vanilla’. At the time I bought them I thought £6.95 for a single annual bedding plant was a bit steep, but I was utterly seduced by the rich vanilla scent. A year on, every plant has come through the winter without once halting a cavalcade of fragrant white flowers. They are now smothered, as if it were August, filling the garden with amazing aroma all day. A plant I couldn’t recommend highly enough and which I will hopefully nurse through a few more winters. Scent is so important in a small garden, especially when one’s only at home to appreciate it in the evening. 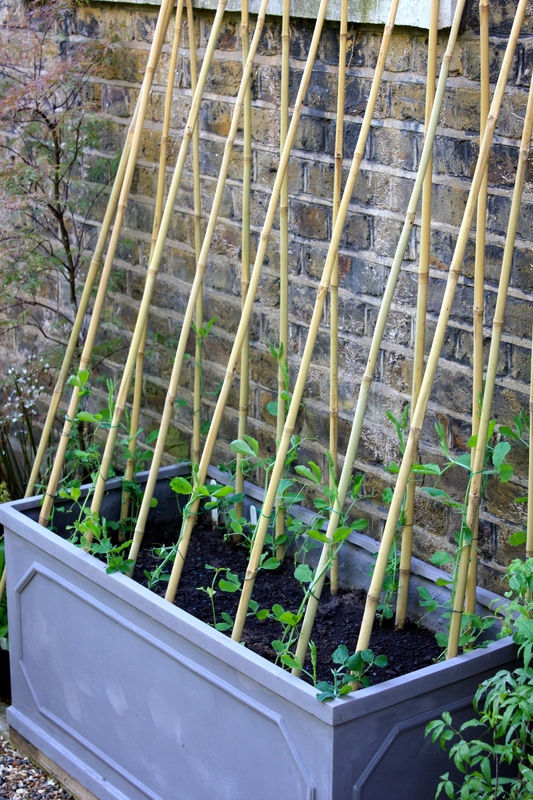 From seed sown in early February, I now have large, vigorous plants of three sweet pea varieties which I am planting in new lead-effect planters. The first is ‘April in Paris’, an exceptionally scented variety with primrose-coloured flowers, edged deep lilac. Next is ‘Sir Jimmy Shand’, a white exhibition hybrid with a lilac ripple across the backs and edges of the petals. Offsetting these paler blooms will be ‘Just Jenny’ which has long stems of deep, violet-blue flowers. Trained against a wall, warmed by the sun until midday, they should grow tall and strong, but I will be keeping my eye out for mildew, whilst tying in and watering regularly. In our coastal garden, summer has been in evidence for weeks. I have taken the sort of risks that would make a textbook author wince, planting tender perennials out from Easter onwards. So far the gamble has paid off, with summer pots looking full and climbing plants already eyeing up the eaves. Only my dahlias remained cosseted indoors, but now that we have guests staying almost every weekend the dining table has to return to its intended function. At 2ft tall and well-branched after lots of nipping out, I planted Dahlia ‘Karma Choc’, D. ‘Amercian Girl’ and D. ‘Jescot Julie’ outside in large terracotta pots at the weekend. This year’s planting scheme is all about orange and the hots pinks and purples that flatter the colour so well. In the centre of the garden table is a pot filled with blue Felicia amelloides, fiery Nemesia ‘Trailing Orange’ (clearly the breeder had run out of ideas when naming this new seedling) and Begonia ‘Glowing Embers’. The latter had better get its skates on before it’s completely eclipsed by its neighbours. 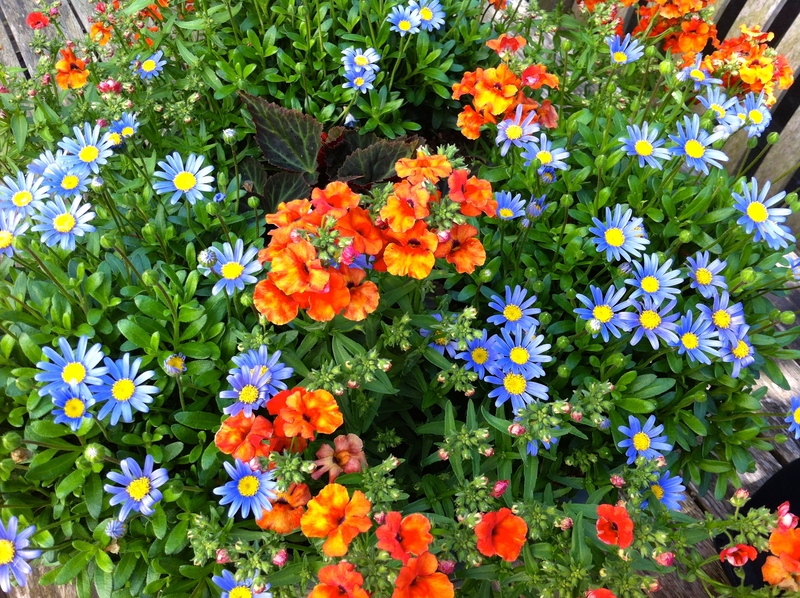 Felicia amelloides, Nemesia ‘Trailing Orange’ and a glimpse of Begonia ‘Glowing Embers’. Finally, and I doubt we’ll be seeing many of these at Chelsea, it’s been a fine growing season for Echium pininana. Hailing from La Palma in the Canary Islands, this splendid plant tolerates frost but does not look better for it, so demands a sheltered position in a mild garden. Other than that it’s not especially picky and seeds prolifically. This plant is now 12ft tall and counting, smothered in bumble bees and dazzling our visitors. I may sound a little smug, but rest assured this is a defensive position and by 8.30am tomorrow morning Chelsea will have roundly put me back in my place. If you are visiting the show this year I hope to see you there; if not, I look forward to bringing you a glimpse of the world’s greatest flower show, right here at The Frustrated Gardener. 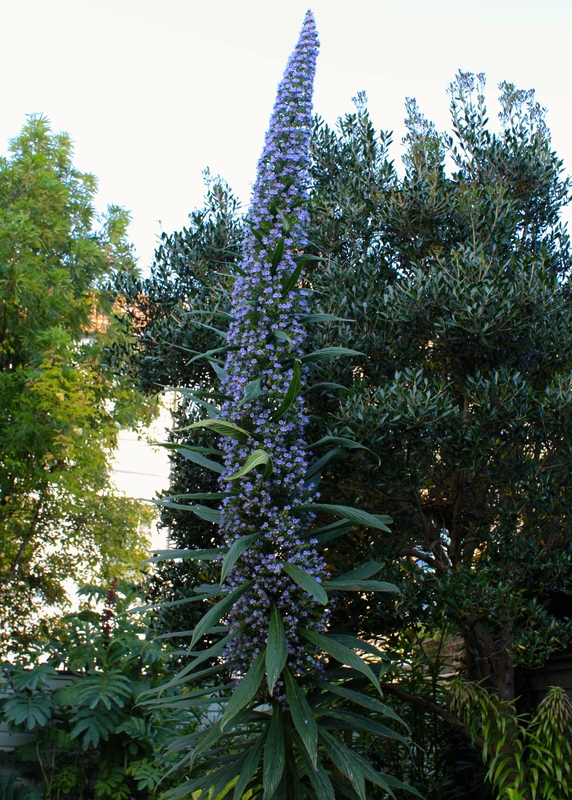 Tower of jewels and beacon for bumblebees, Echium pininana. Lovely photos – and garden! Look forward to your reports from Chelsea .. sadly missing it this year! Thank you. Well, I guess one can’t go every year – it’s getting very expensive too. 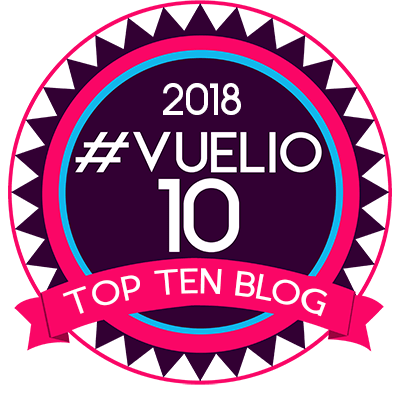 I have written my first post – hopefully lots more to come if I can carve out the time. Lush indeed. It’s been well into the 20s the last few days so everything is growing super fast. I’ve started posting about Chelsea, but have enough photos to last me until about October!! Not enough hours in the day to write about it all, but it was a fabulous day. Thanks Helen – not very Sissinghurst I appreciate but glad you like it. I am visiting tomorrow or Friday with my friend from Australia (who’s come especially for Chelsea and Sissinghurst) so I am hoping the weather stays fine. Looking forward to seeing the rose garden and the vegetable garden particularly. What else is looking good right now?